You can create your own town, visit other people’s towns and explore all the surprises Solia has to offer. You can build and customize your town, from choosing where things are placed to designing the town’s style. Whether you are building a medieval land or a fairy garden, the choice is yours and the possibilities are endless! While exploring the world, you can chat with friends, send and receive mail, sell your items on the market board and grow relationships with in-game villagers, all while finding items along the way. So many Races exist on Solia, you can be anything from a human to an an Imp or even a furry! The options are endless, and when we mean endless we really mean that. And color or design you want you can ether have, make or buy. Create yourself or someone or thing completely different and live a different life in the world on Solia! Make your avatar your own with various items and accessories, new items come out almost weekly! so if you cant find something your style it might come out soon! You already know that you can customize your avatar but did you know that you can also customize the items you wear? that's right almost any items that can be worn on your avatar can be recolored to any color you want and as many times as you want! 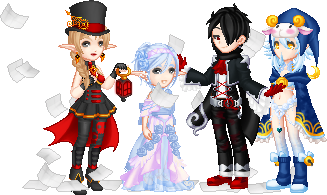 Want to have a Gothic look one day or want to dress up for an event the next, recolor your items to a different feel and look! We may be a gaming site but that doesn't mean we don't have a forum or a community. A lot of user run events and competitions are held year round, not to mention the forums hold it's own forum of RPG with it's dungeon master system. DM your own campaign in the Solia universe or join in a game someone else is hosting, the possibilities are endless! Worlds is the most important part of the site. Here you can access your professions, work on your character level and explore! In Solia Worlds you have your own piece of land that you are free to decorate as you please. Featuring a live chat & Party system why not team up for a round of scavenging and get to know your surroundings. Raise and care for your own pets! They can follow you around while you explore the world or stay on your land as adorable decorations. But they do more then just look cute, every pet has it's own special ability so keep it feed and happy and it will reward you! While your traveling around why not pat and feed other pets too! Leveling up your tamer profession opens up many possibilities for your pets. You can create your own fashion lines on Solia, you don't need to be a top notch artist to be able to create your own items. All the shading is done for you you just draw your design on a tank top, pants or any base item available and Solia takes care of the rest. You can wear, sell, trade or giveaway your creations that's completely up to you! they are your designs to do with as you please.